At last, the Xbox One gets a new Director’s Cut of the popular first-person indie puzzler that first released to critical acclaim on Steam (PC) in 2012. In this “remaster,” Toxic Games listened to player feedback and actually reworked the game from its core, making revisions not only via minor gameplay tweaks but also through the addition of an all-new story. Before I discuss the unique gameplay mechanics that make this a challenging and rewarding experience, let me first describe the setting and narrative – which I found very odd but enjoyably unsettling. Trust me, this will make sense in a minute. Typically game developers start with a storyline idea and create the player-game interaction based on the developer’s vision of how to progress through it. However, Toxic Games received feedback clamoring for the addition of some sort of story after their successful first release. In order to complete this unusual task, they hired industry veteran Rob Yescombe, an award-winning writer who worked on franchises such as Crysis, Alien: Isolation, Star Wars, and the upcoming PS4-exclusive Rime. He describes the new-and-improved Q.U.B.E as a “single-location thriller” through which you figure out exactly what the “Qube” is while receiving context clues from a Cortana-like female guide on your radio intercom. You are told that you are an astronaut trapped in some kind of alien structure (the Qube) that is approaching Earth at a disastrous speed and you must escape if you ever want to see your family again. As such, throughout the entire story you are expecting the worst. Doom increasingly sets in during your progression through the seven sectors and death appears unavoidable as the environments become darker and the narration on your intercom becomes more hurried and pressing/intense. I won’t spoil it, but keep in mind that the developers have thrown in some alternate possibilities for your entrapment and conflicting stories on the intercom may make the player question his/her choices. Ultimately, however, I found no alternate path through the “Qube” and these plot twists are simply story deviations. This unfortunately is an on-rails puzzler, like its initial release was, and I feel that the Director’s Cut could have taken advantage of the added story (with accompanying plot twists) by inserting multiple paths to exit the “alien” maze. Yescombe attempted to create a story about the protagonist’s “state of mind” and something deeper than simply progressing through a labyrinth; however, I found myself much more interested in completing the challenges than finishing the story, and I don’t believe the story adds much value to the experience. Now I’ll discuss the greatest aspect of the game – the actual puzzles and gameplay. And of course, this is the part that needs to be good for me to recommend it. I’ve always believed that one can look past story flaws in a game as long as the core mechanics are solid, and that is certainly true in this case. 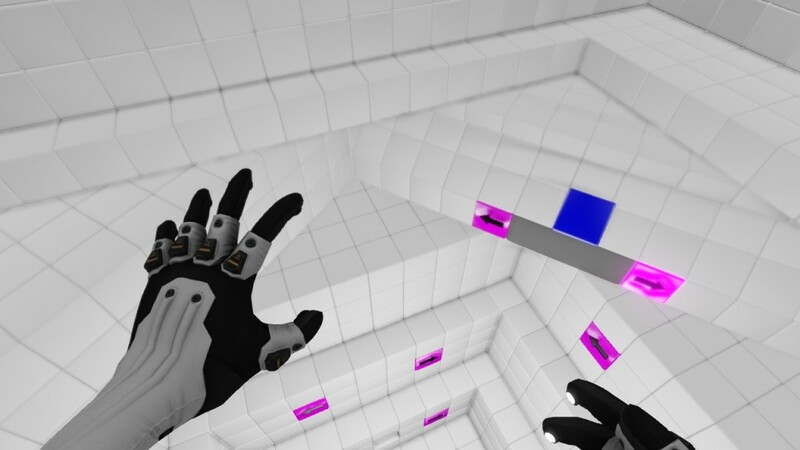 To get to the end of each of the seven sectors, one must solve increasingly-difficult physics-based challenges and 3D puzzles by manipulating blocks of different colors with high-tech gloves. These colored blocks, or “cubes,” exist among ones of identical size and shape, but the immovable ones are white/grey. Thus, environments are very plain and remind me of one large padded hospital psych-ward cell, though this style suits this type of game very well. The contrast of the colored cubes with the plain white ones not only adds life to an otherwise dreary world but also makes completing the trials more straight-forward and unique. 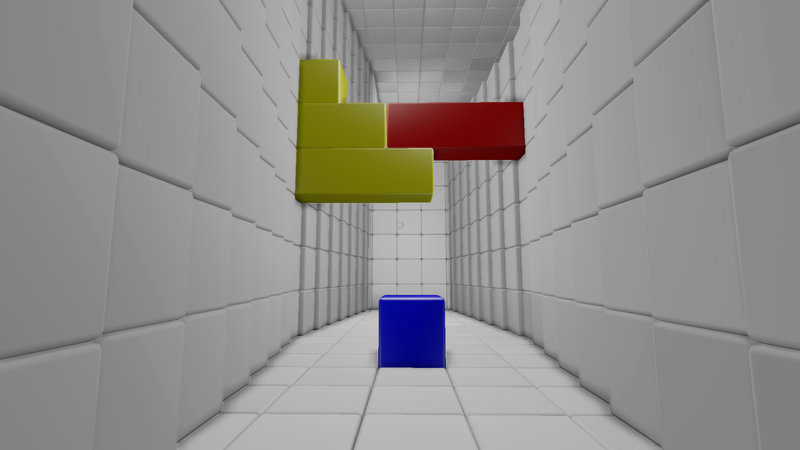 Each color represents a particular way in which you can manipulate the cube, and this system continues throughout the game, with only one new color at maximum introduced in each subsequent sector. For instance, the red cubes can be moved outward a maximum of three times, whereas the blue cubes depress into the ground and act as a spring when the player steps on it or puts another object (such as a ball) on it. This keeps the gameplay very fluid rather than constantly introducing new mechanics like other puzzle games. 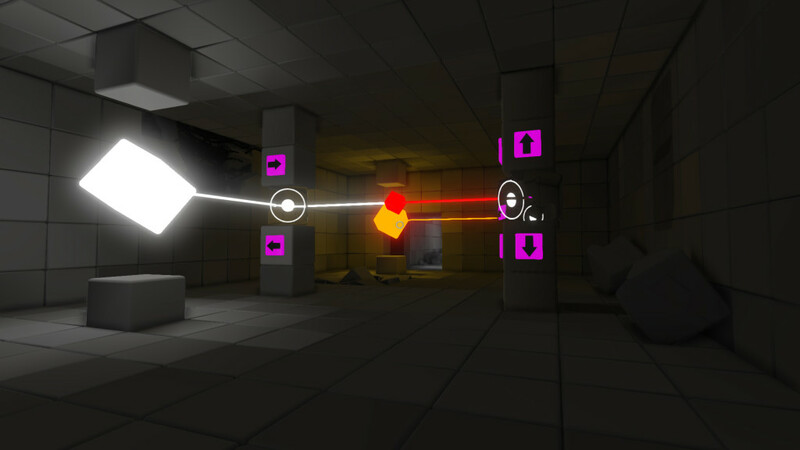 While one may argue that new mechanics throughout a game keeps it fresh, in this case the freshness comes from increasingly difficult puzzles that are certainly on the Portal-level of difficulty (hopefully you are familiar with Valve’s Portal if you are a puzzle-game fan). Though I did allude to the fact that this game is quite linear in progression, the same is not true within the individual challenge rooms of the sectors. By that, I mean that puzzles can be solved in a bunch of different ways using different combinations of the colored blocks. This certainly reduces the possibility of players becoming frustrated with not finding that one way to complete the task, which often leads people to abandoning otherwise excellent games. Thankfully Toxic Games thought about this and allowed gamers to find multiple ways around a puzzle, ensuring that more people see the end. That said, this game is not easy and the unique challenges and gameplay style are enough to satisfy any puzzle gamer. In addition to the story, the developers have included an all-new time-trial mode in the Director’s Cut. This includes 10 levels that put the player against the clock to reach the end by any means necessary. As mentioned before, the multiple methods of puzzle completion make a return in this mode, even though the levels are completely unique in their construction. Another unique feature in this mode is the presence of power-ups that give you valuable abilities such as a speed boost. Clearly something like this comes in handy in time-trial conditions, so having these only in this mode does not bother me. Also new in the Director’s Cut is a brand-new music score and new achievements/leaderboards. I found that you could unlock many of the achievements (including those of highest achievement score) by simply progressing through the seven sectors, but other achievements are more difficult to obtain, such as finding secret rooms and completing the puzzles found in them. These rooms are not obvious, as you have to find walls that have minor imperfections and walk through them in most cases. For completionists, these hidden areas are a must-find, and present a rewarding challenge outside of the main progression. Other than the story being somewhat unmemorable, my main issue with the game is its length. The game can be completed in one sitting, as I have mentioned it is only seven sectors. The sectors are of varying length, however, so don’t expect the last sector to be as short as the first. I would estimate that the game took me about 5 hours at absolute most to complete. I would be happier with the price of $9.99 if it came with a couple more sectors, and the game’s length was closer to 6 hours. That said, the game as a whole is a good puzzler, and the added features represent responses by Toxic Games to the customer requests. For that, I must give the developer credit, even though I didn’t particularly care for the story’s plot. I would recommend this to gamers based on the unique gameplay, the interesting visual style, and rewarding challenges.